Sitting Quietly in the Yard | Bannor & Bannor Inc. Sitting Quietly in the Yard | Bannor & Bannor Inc. I took a break today and sat out in the yard enjoying the mild weather. Of course I had a camera in my hand. 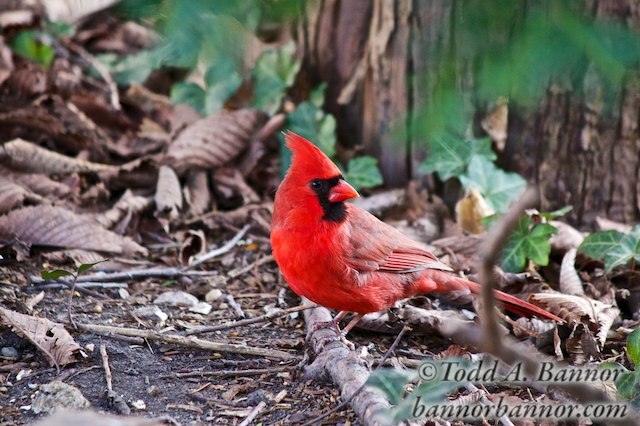 Our local male cardinal paid a visit to forage for seeds dropped by our wildflowers about twelve or so feet away from me. I grabbed a few quick shots. Here’s the best one. I wish the twig didn’t cut through his tail, but oh well. This photo wasn’t taken with outrageously expensive equipment, just a Canon 60D and the inexpensive but optically quite good Canon 50-250mm zoom lens. While this lens isn’t built to the standards of much more expensive Canon “L” lenses, it punches above its class in image quality. This lens is available bundled with a Canon Rebel T3i and an optically good 18-55mm lens (no longer available from Costco.com), if you’re interested in a really good lightweight entry level SLR camera kit. The T3i uses essentially the same image sensor as the 60D and eighteen megapixels is more than enough for just about any photograph.